Rock the house with automatically synced, non-stop audio and MIDI clip grooves using the amazingly flexible Performance Panel. Create mixes and mashups with audio warping and song slicing. Manipulate the Performance Panel under your fingers with a Novation Launchpad, MIDI controller, or even your computers keyboard, and jam along with Mixcrafts powerful virtual instruments. Record loops directly to Performance Panel grid locations for instant creation of layered live loop performances. Get ready for a plethora of virtual instruments, including emulations of classic synthesizers, rock organs, and electric pianos. 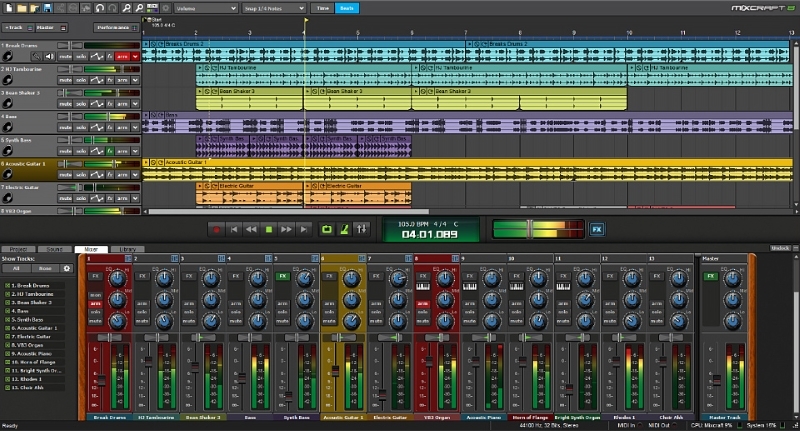 Mixcraft 8 Pro Studio is packed with over $1250 worth of additional plug-ins, including Melodyne Essentials, Celemonys astounding pitch correction and editing suite, which goes beyond the plug-in realm with full integration into Mixcrafts audio editor window. This page was last modified on 5 April 2019, at 03:58.